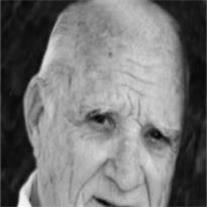 Ralph E. Harris, 83, passed away on January 5, 2011. He is survived by his wife of 62 years, Louise Johnson; children Paula (Morris) Williams, Edward (Brenda) Harris, Cathy (Franko) Fritz, Lori (Darin) Huffaker; 11 grandchildren, 9 great-grandchildren; 3 sisters and 2 brothers. Ralph was born and raised in Lake City, Florida and later served 26 years in the United States Air Force rising to the rank of MSgt. The Air Force sent him around the world including tours of duty during the Korean and Viet Nam conflicts. Ralph retired to Mesa in 1974 where he managed the Mesa Country Club and later the San Juan Country Club in Farmington, New Mexico. After 14 years, he retired a second time. In his later years he enjoyed the morning papers, conversations, the Price Is Right, people-watching, family, and eating lunch out. The valley restaurants will dearly miss him as well as his family and friends. Services will be held Wednesday, January 12, 2011, at the Porter Park Ward located at 1852 N. Stapley, Mesa. The viewing will begin at 10:00 a.m. with services at 11:00 a.m. Arrangements by Bunkers Garden Chapel, 480-696-6883.